Everything changed for African-American Candice Drucker as her friend and fellow prostitute was beaten up and almost killed by their pimp, Frank. Because of this, she decides to run from him. Jack Hayes, a racist skinhead was also in trouble, and everyone from the local police to the FBI were searching nationwide for him. He is on the run. 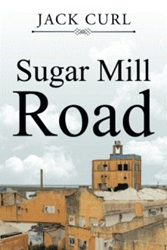 In his latest novel titled “Sugar Mill Road” (published by Xlibris), Jack Curl tells the story of these two people who are both on the run. They end up staying at an abandoned factory. They meet and fall in love and discover that in the nearby town, a serial killer is on the loose. And they are determined to stop him. Will they succeed? Candice was afraid, she was alone in an abandoned building in the dark in a remote area of Longmont. She finally answered “My diary is gone and it means the world to me and I’m here because I have nowhere to go, what do you care, and who the hell are you anyway.” “I don’t care and you don’t need to know who I am” Jack barked back. Jack Curl is a 60-year-old happily married man with three grown children, two grown stepchildren, 10 grandchildren and one great-grandchild.